I grew up the youngest of four boys in a sports crazed house. We talked about competition and competed all the time. No, the competition was not typically against each other, though Sunday morning basketball games could get ugly. As the youngest, I didn’t win often. But I always wanted to and didn’t accept losing as my fate due to birth order. 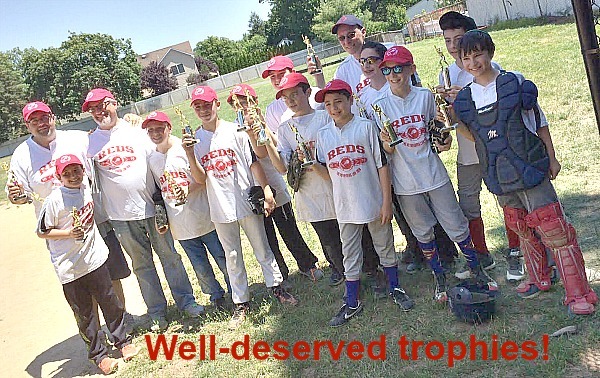 This past week, my son’s Little League team lost in the Finals. In this day and age, we’re supposed to tell the boys to just have fun and try your best. But I wanted to win. The team started off 0-6. Now, I told you before the season started that my primary goals were to help the boys improve and to have them feel part of a team. But I also wanted to win. These boys stuck together – and I’d like to think each of us coaches was part of the reason – through the losing. Their attendance, attitude, and effort did not waver. And it wasn’t easy. The team was struggling to get hits, let alone score more than a run or two. The fielding was inconsistent. It seemed like every error made turned into runs for the other team. We were getting beat up and looked overwhelmed. Though only six games, it felt like a long season. Then came Memorial Day weekend. We were scheduled to play a double header. The heat was intense – near 90 with humidity. Yet, every kid showed up except those who had previous plans. How easy would it have been for parents and kids to blow off the games with the heat and the holiday weekend? 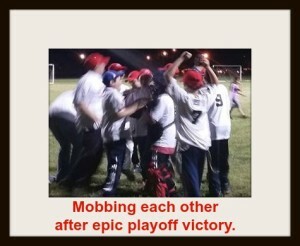 We won game one of the double header. And there was relief on the faces of many: those who run the league, parents, and friends.Then came game two, and we won again. Handily. We scored more runs in that game than we had in the previous five combined. The playoffs started the next week, and every team makes the playoffs. Ya gotta love Little League. I was optimistic – why not. Something was different. The burden of losing had been lifted, and there was more confidence. Game one of the playoffs was an epic. Games are normally 90 or so minutes and six innings. This game, however, went 2.5 hours and eight innings. We had to switch fields because the one we were playing on did not have lights. Anyway, we blew a big lead, came back, and came back again. It was intense. The boys mobbed each other at the end. The semifinals and finals were to be played back to back on Father’s Day Sunday. After winning the first – our fourth in a row – we were going up against the best team in the league. 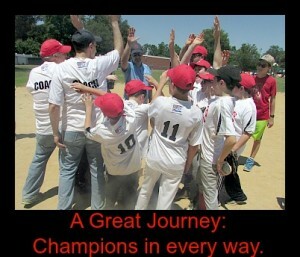 They had beaten us earlier in the season 7-1 and had won their semifinal game 10-0. We got out to a 3-0 lead and held on to it for few innings before giving up five runs in the bottom of the fifth. Somehow, our team managed to score five runs and took an 8-5 lead going into the bottom of the sixth. We gave the runs back and went into extra innings. Both teams made errors. Both teams were nervous. Finally, after hours in the heat and two extra innings, the other team found a way to get a run in and won 9-8. As a competitive person, I wish the game and season had a Disney ending. Those boys deserved it. Despite coming up a bit short on our journey, the boys won in so many ways. Many of them showed improvement through the season in hitting, fielding, and other ways that go beyond the field. There were weaker players and stronger players, but ultimately, these boys were a team as everyone rooted for and supported each other. I know BR and I will talk about this season and some of the crazier games for a long time. I think some of the other team members will as well. We went on a great journey together, and we’ve changed because of it. I couldn’t be prouder of our team. Congratulations Coach! Very proud of you and the team, what a great season, even if you didn’t win – look at the stories you have to tell, there were some GREAT games in there! Thanks Kate. I agree – it was special. That is not just fun, it is a great life lesson. Cool story.